Rebirthed Beacon’s Quaint Make-Over Rediscovered by New York Times! Look, the New York Times mentions Beacon! Here we go again, with the Times announcing our rediscovery, our rebirth, our make-over. These bits of journalistic cotton candy have been spun out with minor variations every two or three years for at least the past decade. Here’s one from 2007, when Clara Gould actually was the mayor. Note references to DIA, coffee shop owner, etc. : A Makeover in Progress, and Modern Art, Too. Here’s another, that ran in the Westchester section in 2009: Beacon: A City Reborn As a Haven For Art. (Full disclosure: My old shop, the Iron Fish Trading Co., is shown in the photo [or at least the mess it made on the sidewalk], and my wife’s gallery is prominently featured in the article. Okay, so they wrote one good one.) And so on. Go ahead and track down the rest. At least on the latest go-round the reporter did not simply rewrite the previously run article—some years it seems as if they just move paragraphs around. One iteration of Beacon redux mentioned the Tallix art foundry as if it were still operational, despite the fact it had been closed for years. I find the manner in which these articles are written tiresome in the extreme. It’s like the towns outside of New York City are just another product for its residents to consider, like a Hyundai review in the Automobiles Section. Beacon is “quaint” (ha) and you can buy in for $225,000—grab a little weekend place right off Main instead of staying at a hotel every other weekend. Throw in some hats and bricks, a few quotes from a local or two and a worn-out history tidbit, then send the whole superficial confection off to the real estate desk. Spare me. On the other hand, I find it equally troubling that the city fixates more on tourism and residential development than attracting real jobs to create a real local economy.The building inspector’s quote regarding our luck with DIA—”They found us,” about sums up the longstanding approach to economic development: let’s see who may come knocking at our door, then fall all over ourselves to let them in. Yes, entities like DIA are worth welcoming, but that doesn’t mean we can’t be proactive, or selective, with an eye to the future. Most of the people knocking at the moment are looking to build residential projects of 20, 30, 80, 100+ “units,” to sell to New York Times readers from Manhattan and Brooklyn. I guess that builds the holy grail, our tax base? And we’ll know exactly when we’ve built enough, because, well because we just will! (Maybe we’ll know when it takes half an hour to pull out of our driveways.) Maybe we’ll know because our taxes will be so low by then we’ll all be out at the latest restaurants celebrating our good fortune (if we can find a seat not occupied by someone visiting from Bed-Stuy). That’s when we’ll say, okay, thank you, that’s enough, developers. Thanks for the tax base, suckers! I understand some people may initially find out about Beacon through articles like this, people who add energy to the city. And I get that it might give a little boost to local businesses that depend a lot on money from out-of-towners. Mostly, it’s harmless, if annoying, fluff. The danger lies in starting to believe the one-dimensional high gloss hype. Like all advertising, it has a way of sinking in and affecting our grasp on reality—for instance, when people start talking about Beacon being in a “bubble,” impervious to influences from the outside world. That can lead to bad decisions by individuals and by the community as a whole. If a serious newspaper or journal did an in-depth, long form article or series about the city, its history, and its current strengths and problems and how they relate to today’s world, well, that I could read without my eyes glazing over like a frosted gluten-free doughnut. But let’s all agree to stay dignified and not get too excited that we’re in the real estate section of The New York Times. 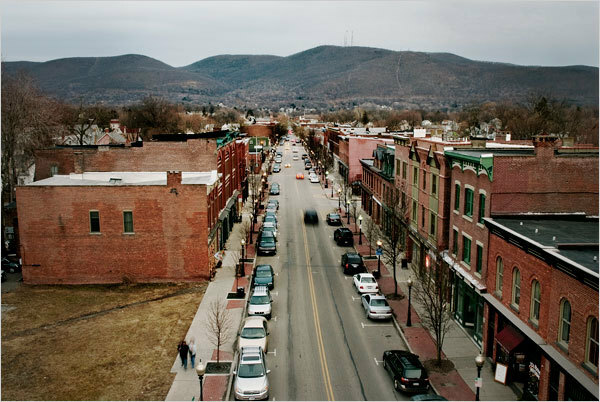 Feature photo: Main Street, Beacon, by Randall Okey. One Response to Rebirthed Beacon’s Quaint Make-Over Rediscovered by New York Times! I think Beacon should run a local version of the State’s “Empire Zones” or whatever they call the tax-free business incentive program in select areas. Why not give new businesses, that meet some criteria (type, size, etc. ), a tax-free status for 5 to 10 years, as an incentive for them to move here?